Good news for those of us who regularly email Microsoft Office documents: You can now edit Office attachments directly from Gmail. The new feature is accessible by clicking the pencil-like Google Drive edit icon that now appears when you hover your mouse pointer over an attachment. This way, you can make small, simple changes to documents, spreadsheets and slides without needing to save locally or converting the file format. Another nice benefit: Google Drive now automatically recognizes 15 new Office file formats (dot, dotx, dotm, docm, xlt, xltx, xltm, xlsm, pot, potx, potm, pptm, pps, ppsx and ppsm) for editing through Docs, Sheets and Slides. They’re not the most common of extensions – mostly for macro-enabled files and templates – but their inclusion is definitely welcome, especially for those of us without Microsoft Office loaded on every computer. Google is also promising “improved charts, images and tables support” for these files. 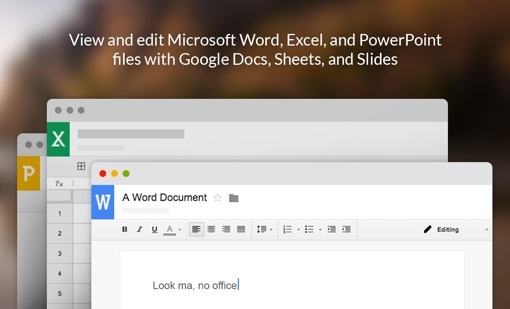 Being able to edit Office files in the cloud is not unique to Google Drive – Microsoft’s has its own web-powered Office document editor as well. But most of its best features (like editing docs on an iPad) require an expensive subscription to the Office 365 service. Google Drive, meanwhile, offers free file editing, 15GB of free storage and the option to expand to 100GB for just $1.99 per month. And you don't even need to own a copy of Office to use it. You can learn more about the new Google Drive feature and the specifics of how to use it by visiting the Google Support site. For more on the different cloud storage options available, check out Techlicious’s cloud service comparison guide.